The revised Easter and ANZAC 2014 Working Arrangements for our Fremantle have just been released. These have been collated by the W.A. Port Operations Task Force and include both Patricks and DP World, along with Quarantine and Customs Services. Please also find the 2014 Easter vessel schedule. 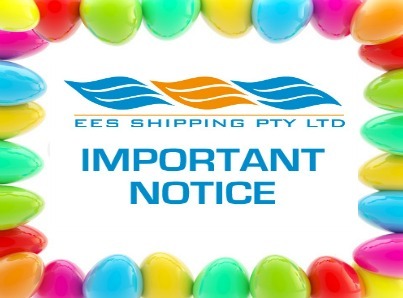 EES office will be closed Good Friday 18th April through until (and including) Monday 21st April. We will re-open on Tuesday 22nd April. Our office will also be closed on Friday 25th April in honour of ANZAC Day.